…another heat wave rolls in as the “last blast” of summer. Oh, my dearly beloved New England, why? You see, normally I’m gung-ho about fall desserts, ready to preheat the oven that’s gotten far too little use this past summer. I don’t mean to be ungrateful to summer, but really, she makes baking a hot mess! Not to mention autumnal desserts: spiced chocolate-butterscotch-chip pumpkin bread. Apple pie, apple crisp, apple crumb bars, apple dumplings… apples that, while delicious when pulled off the tree, are spectacularly transformed in the oven. Excuse me as I go all Julie Andrews on you, but these are a few of my fav-or-ite things. Mother Nature, though, really couldn’t care less about my fall fantasies, so I suppose it’s best I embrace her (literal) warmth and hold out from using the oven for at least another few days. And an awesome no-bake recipe like this one certainly makes her trial on my patience more endurable! Imagine: an Oreo cookie crumb crust, and a thick one at that. Silky chocolate mousse that requires very little prep. A layer of whole Oreos for good measure. Rich mascarpone whipped cream, studded with toasted hazelnuts if you so desire. Yet another fluffy layer of pillow-y whipped cream, garnished with more Oreo crumbs and hazelnut pieces- because it’s all about the aesthetics (sort of). Each individual component is remarkably simple on its own. 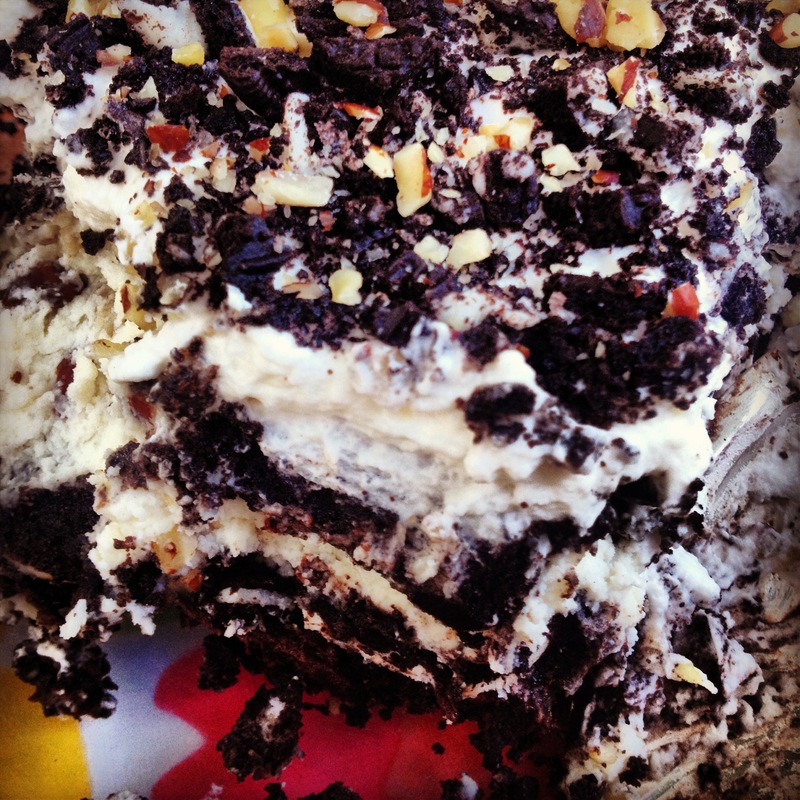 But then, brought together in the Holy Matrimony of this no-bake dessert, it’s magical. Words escape me, and thus, it can be constrained to no name. Sure, it’s not a warm slice of apple pie alla mode, but it’s a sweet and fairly simple way to enjoy the dog days of summer. Even I, who can’t keep my mind from dreaming of leaf-peeping and decorative cornstalks framing front doors, find myself thanking Mother Nature for her last taste of summer because that taste sure is a delicious one when it’s full of this blissfully bake-free dessert. *You can easily toast hazelnuts by placing them in a single layer on a paper plate in the microwave for 12-15 minutes. Just pay attention to the smell to prevent burning! More info on toasting nuts can be found here. 1) Crust: In a food processor or plastic bag, crush the Oreos until they’re small crumbs but with a few chunks remaining. In a 9×13” pan or large serving bowl with straight sides, add the crumbs and crush further with a fork. Pour the melted butter over the Oreos, and combine with the fork, making sure all crumbs are coated. Using your hands or the fork, press the Oreos into an even layer on the bottom of the pan/bowl. A. In a heatproof bowl over a saucepan of simmering water (or in a double boiler if you’ve got one! ), combine the chocolate and water. Stir occasionally, until the chocolate is almost entirely melted. Remove bowl from heat and stir until mixture is completely smooth. It should be shiny. Set aside to cool. B. Using an electric hand-mixer or standing mixer, beat the egg whites and salt. Whip until stiff peaks form, scraping down the bowl to make sure the whites at the bottom are also whipped. C. Once the chocolate mixture has reached near room temperature, stir in the egg yolks. Add one third of the whipped egg whites to the chocolate mixture and gently fold in using a rubber spatula. Fold in the remaining egg whites until streaks are no longer visible. 3) Scoop the chocolate mousse onto the crust and spread in an even layer to the sides of the pan/bowl. Next, create a layer of whole Oreo cookies on top of the chocolate mousse such that all the Oreos are touching. Refrigerate while you make the whipped cream layers. A. Using an electric hand-mixer or standing mixer, beat the heavy cream on medium-high speed for 3-5 minutes, or until stiff peaks begin to form. Transfer half of the whipped cream to another bowl and refrigerate. To the remaining half of whipped cream, add the mascarpone cheese, and gently fold it into the cream until no clumps of cheese remain. Add powdered sugar to taste. Finally, stir in the toasted hazelnuts. B. Remove the pan (with Oreo crust, chocolate mousse, and Oreo layers) from the fridge, and gently spread the mascarpone whipped cream in an even layer over the Oreos. On top of the mascarpone whipped cream, add another (and final!) layer of whole Oreos. 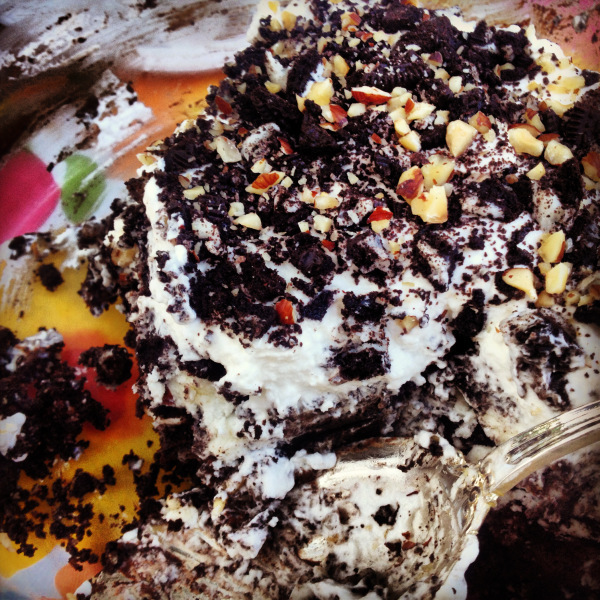 5) Remove the half of untouched whipped cream from the fridge, and spread over the final layer of Oreos. Garnish the trifle with any remaining Oreos, chopped, and hazelnuts. Refrigerate until serving. Enjoy!